Local activists led a call Saturday for people across Chicago to come together in peace, love and unity to combat violence in the city. CHICAGO (WLS) -- Local activists led a call Saturday for people across Chicago to come together in peace, love and unity to combat violence in the city. 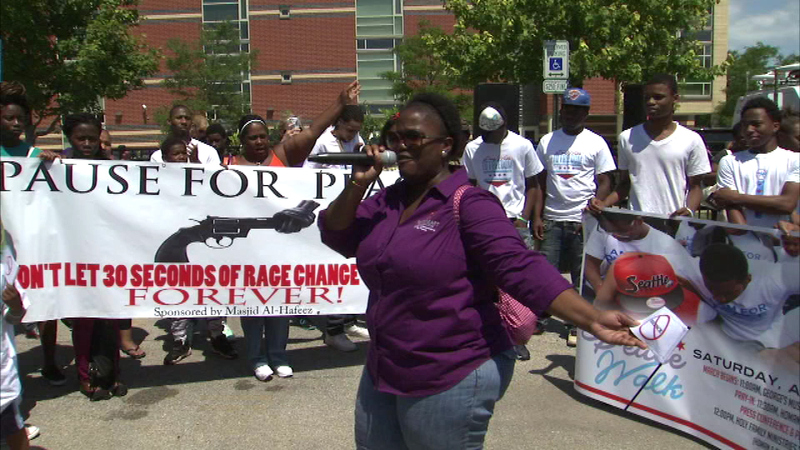 Community leaders, elected officials, clergy and everyday people took part in the Chicago Youth Peace Walk. Activists FM Supreme and Ameena Matthews led the walk. Russell Simmons, the co-founder of Def Jam Recordings was a sponsor. Some attendees carried signs with pictures of guns and the message, "Don't let 30 seconds of rage change your life." "We must be the change we wish to see," said Jessica Disu, Chicago International Youth Peace Movement. "Nobody's coming to save us, we must save ourselves. Nobody's coming to change us. We must change ourselves. And (Saturday) we showed there can be peace in Chicago." Performers also repeated the message of peace. One person pointed out if we cannot have peace within ourselves, we cannot have it our communities.